Black Walnut Small Jumbo 2018 ... Completely Nuts!!! Black Walnut Small Jumbo 2018 "Roasted Nuts"
and can lead to abuse. This Grand Concert made mostly from soft woods has a sweet soft tone. It is a perfect partner for making all kinds of music. Here's a pair of small jumbos, one right handed and one left handed made from locally sourced cherry and red spruce. They share the same multi scale, 26 3/16" bass and 25 1/2" treble wich makes them particularly suitable for lowered tunings such as dropped D, DADGAD and open C. Wide spacing at the nut (1 13/16") and at the bridge (2 5/16") is perfect for finger style playing and advanced chords while the florentine cut away permits access to the highest frets. These are loud guitars with a wide dynamic range, a lot of headroom, exceptional balance in all registers and remarkable sustain. They are ideal for solo guitar playing. 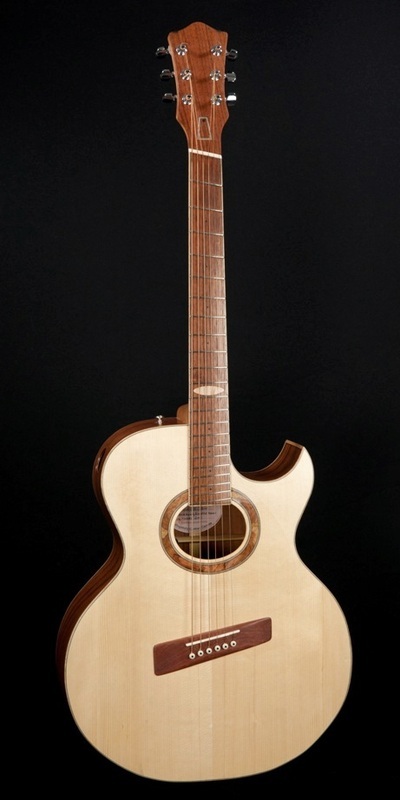 This is a special guitar for me. 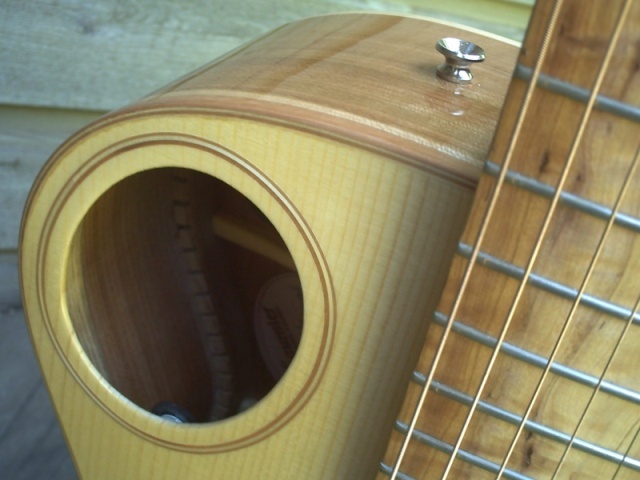 It's top is made from the same piece of spruce I used to make my first guitar in 1993. It comes from a floor joist I salvaged from a century old house I renovated in the late eighties. Age gives the spruce a darker color reminescent of cedar. It is also lighter and more brittle than the spruce I usually work with. The back & sides are made from a mahogany door jamb salvaged from the same house. As all the small jumbos in this serie, it is loud, projects well, has a wide dynamic range and is very well balanced across all the registers. 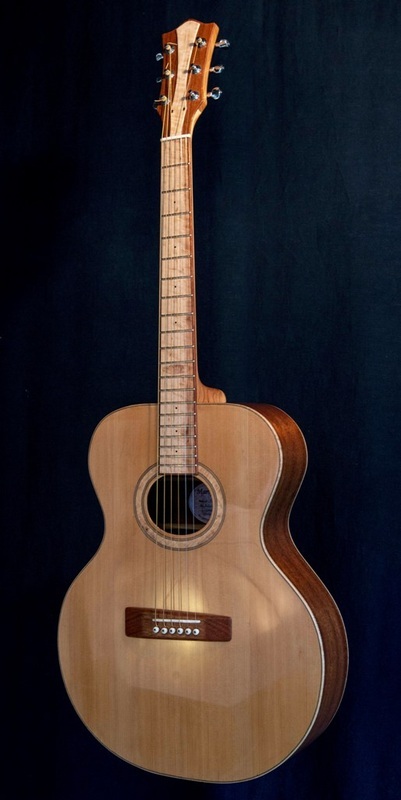 People who tried this guitar at the Montreal Guitar Show that year said it sounded like a 20 to 30 year old guitar and it was barely two days old. Since then it has opened up quite a bit and possesses a dryer more immediate sound than the guitars I made at the same time. 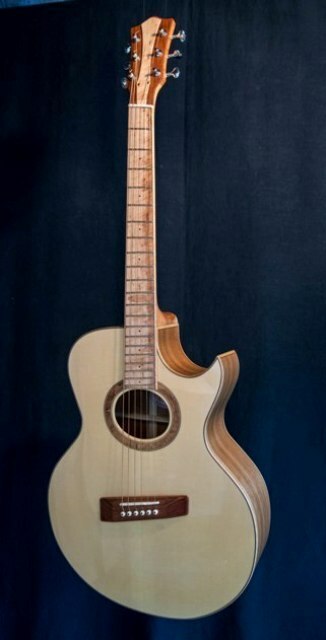 This is truly an unique guitar that cannot be duplicated. 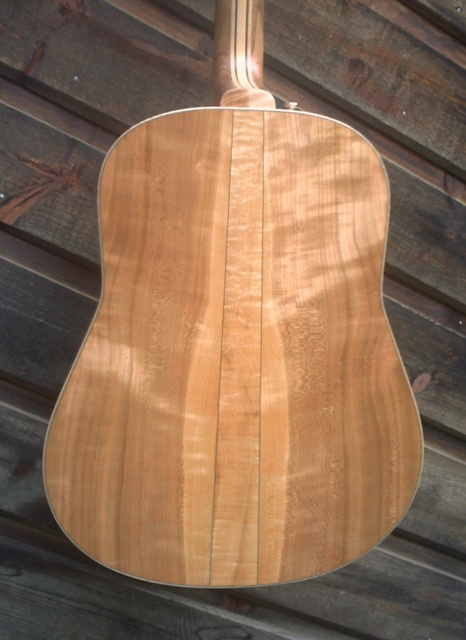 This cherry and red spruce small jumbo was custom ordered and now lives in Florida. 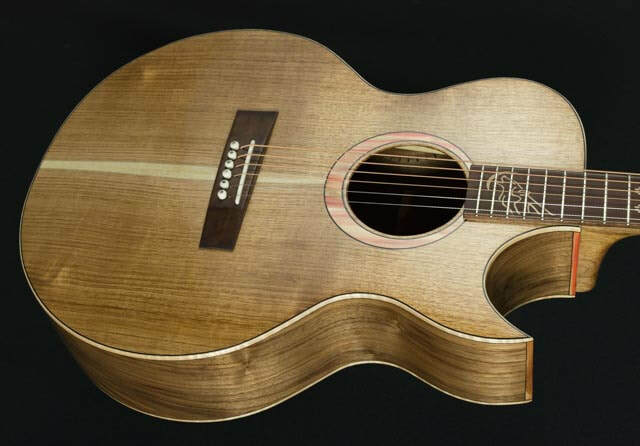 The owner chose all the wood for the back, sides, top, fingerboard and bridge after choosing from four pieces for each part. The contrasting headstock overlay was his suggestion and I liked it so much that I incorporated it to the guitars I've made since then. 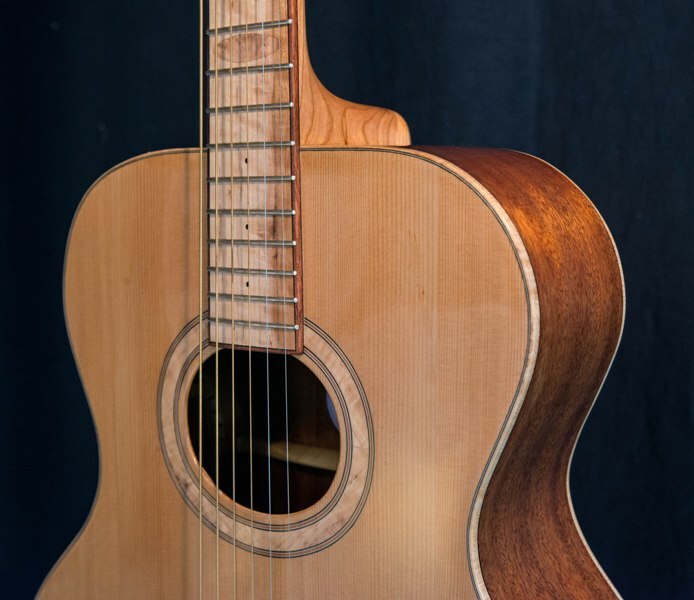 Sonically it compares to my other small jumbos, it is a very versatile guitar with a string spacing suitable for fingerstyle or strumming and a very low action making it easy to play. 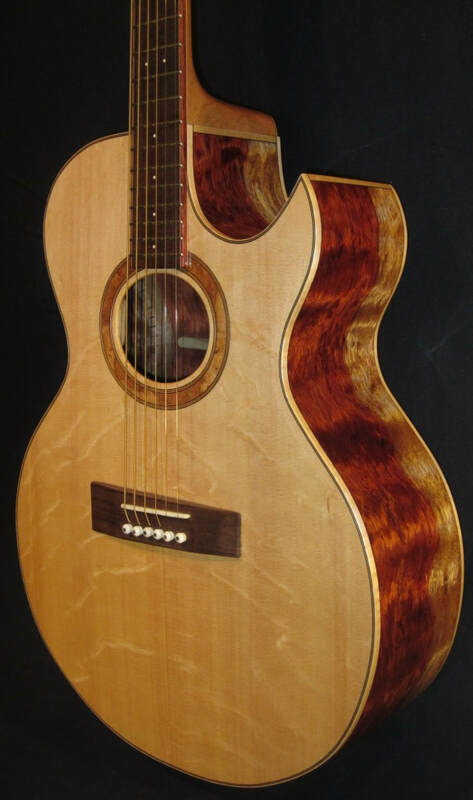 After receiving it the owner wrote saying how pleased he was and that the guitar sounded and played better than he expected, he also was surprised at how beautifull the cherry back & sides were. (Harvesting and cutting the tonewoods myself gives me acess to beautyfull and sonically superior wood. It's a lot of work but it is worth it). This was my first experience with very hard and heavy wood. 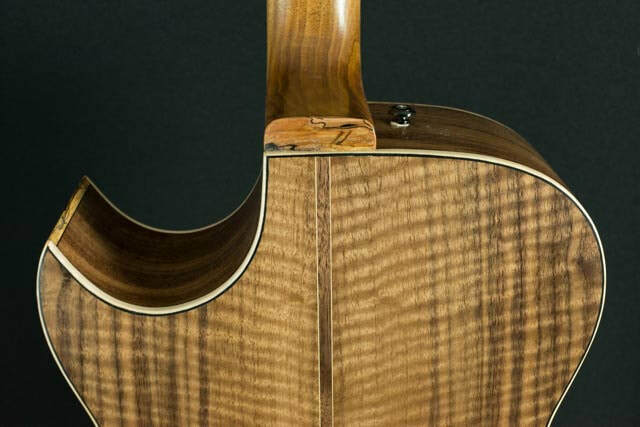 The main diffference between this guitar and one made from cherry is that it is a little brighter and projects maybe a little bit more in the high registers. 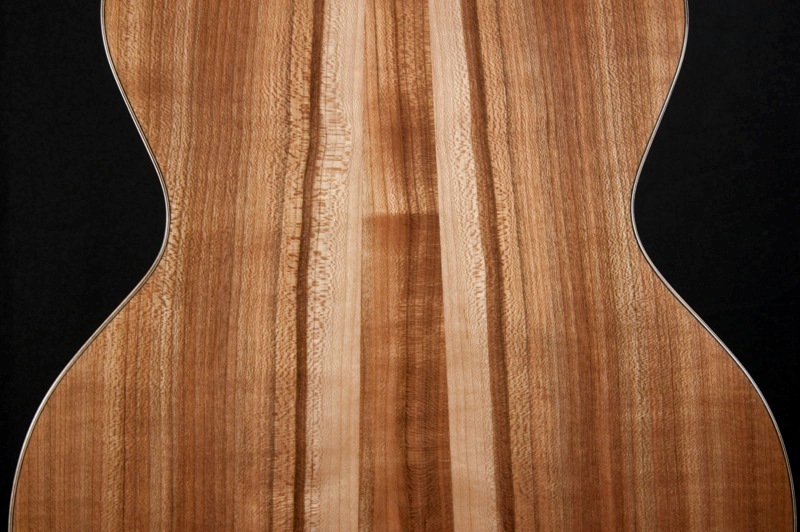 This wood is a bit harder than Macassar or West African Ebony and thus it is well suited for fingerboards & bridges. 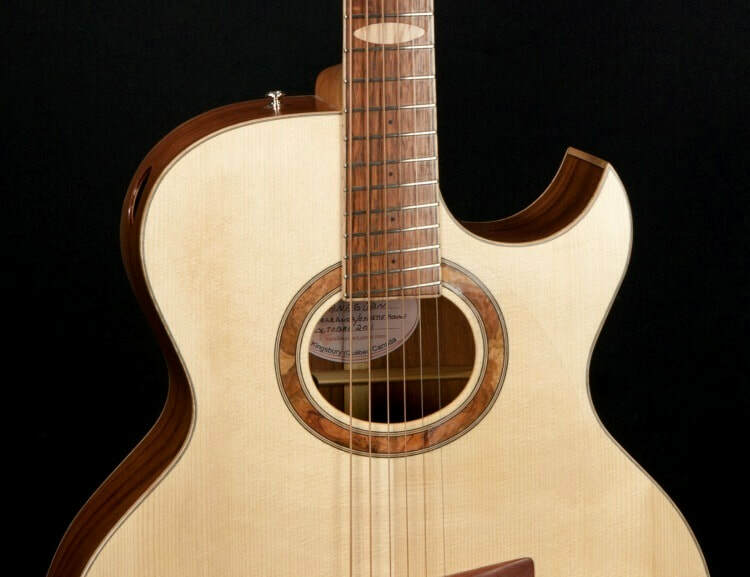 The sound is excellent but not that much different from the cherry or mahogany guitars in this serie. 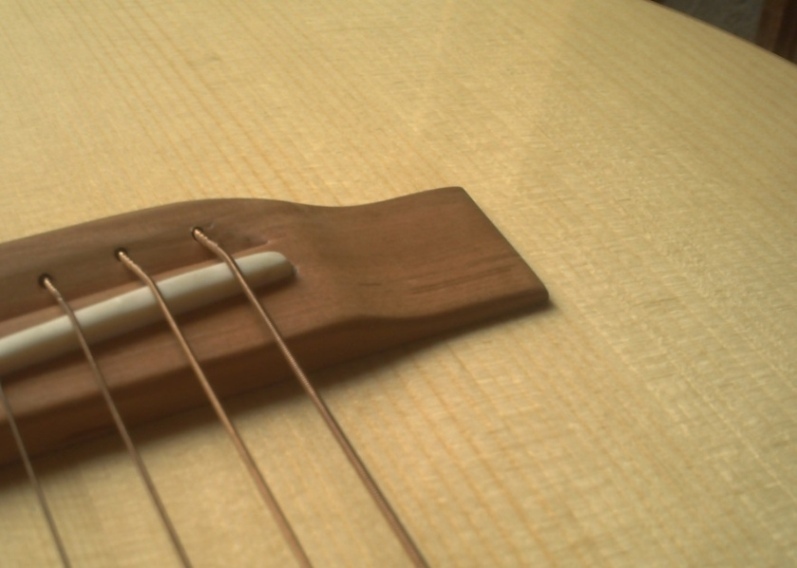 This is because the sound is defined by the top and the bracing pattern, in this case a combination of fan braces like a classical guitar and X braces like a steel guitar. 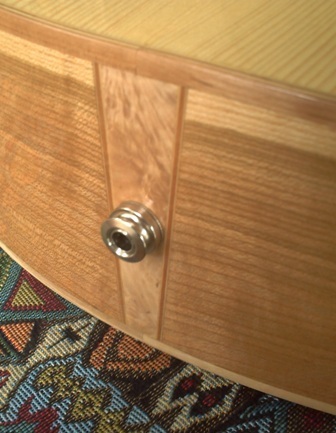 The three main load bearing braces are made from an assembly of white cedar and red spruce put together in such a way that they are much lighter & stiffer than a one piece brace made of spruce. 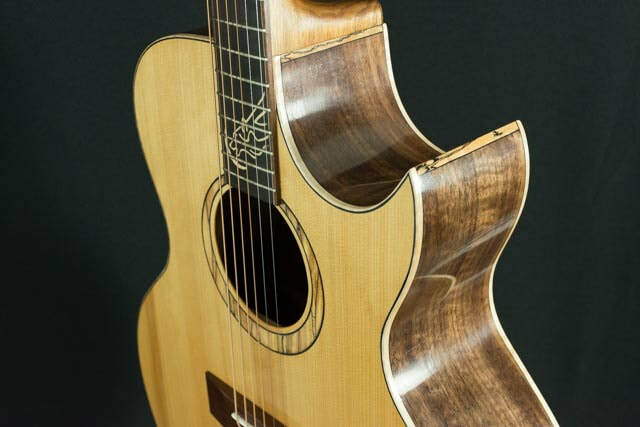 This design gives this guitar his exceptional sustain, perfect balance and lots of amplitude regardless of the wood used for the back & sides, a sound that is truly unique. 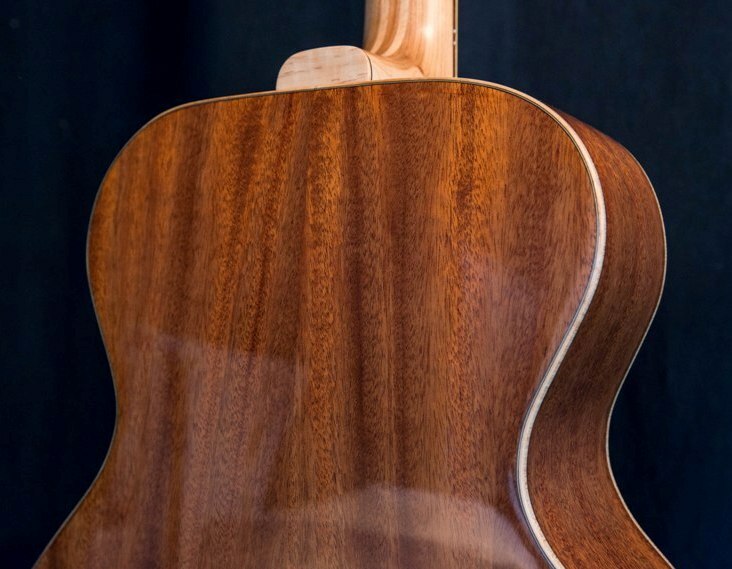 This small jumbo is the same as the one described above except that the red spruce top comes from the first spruce I harvested in 1998. It has bolder grain, more late growth and wider spacing between the lines. 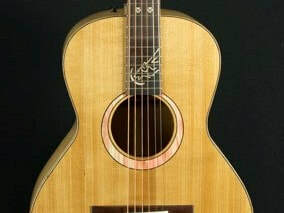 This kind of spruce is uncommon in guitar constuction but aesthetics do not always equate with better sound. This spruce is hard, very light and very stiff especially across the grain enabling me to make the tops thinner wich results in a very responsive guitar. This is the first small jumbo i made, the body size and shape are the same as my 16" archtop. It is the prototype wich defined my other small jumbos and the first multi scale steel string guitar I made. 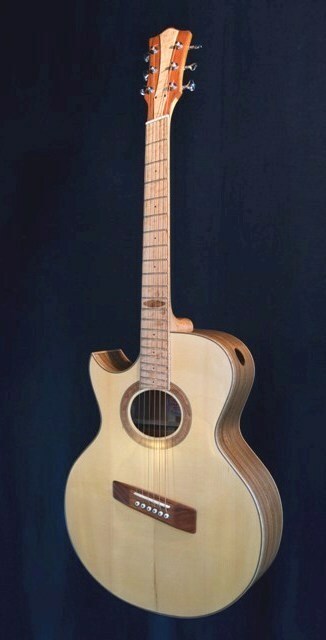 It is the first guitar with the hybrid fan and X bracing pattern described above. 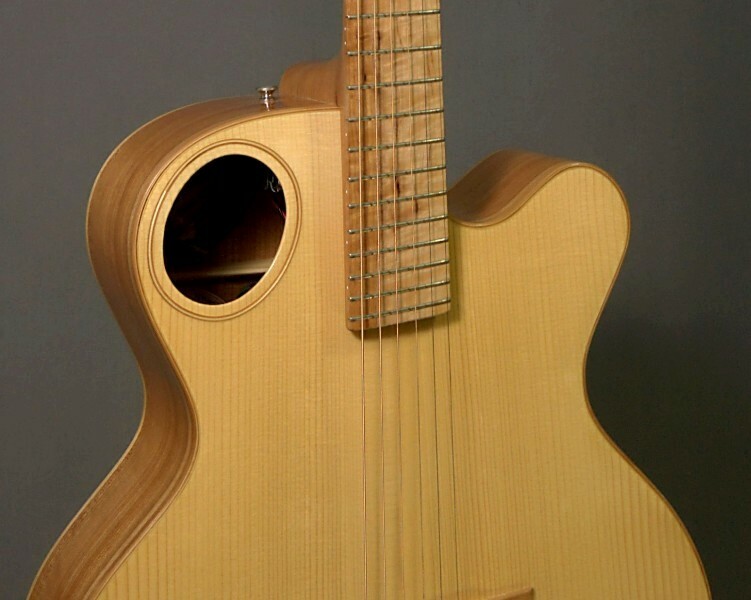 The biggest difference is the offset sound hole wich is placed in an area of the top that is sonically less active. 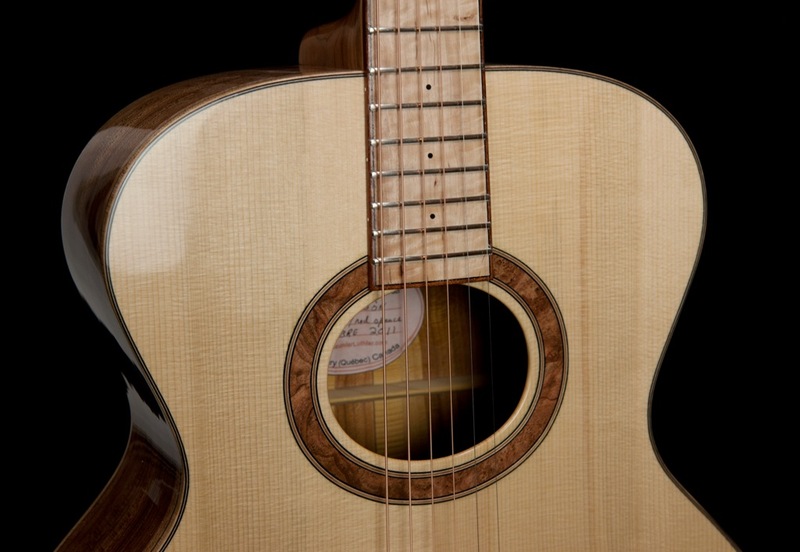 The absence of a hole between the bridge and fingerboard makes the top much stronger and it can be thinned much more than on a conventional guitar. The sound is spectacular. deep well defined bass, rich and complex mids and sparkling highs, the sustain and dynamic range are piano like. 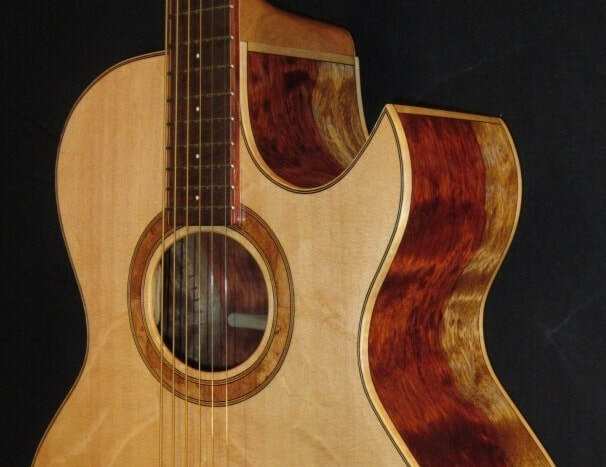 This guitar is a finger style solo guitarist's dream axe. 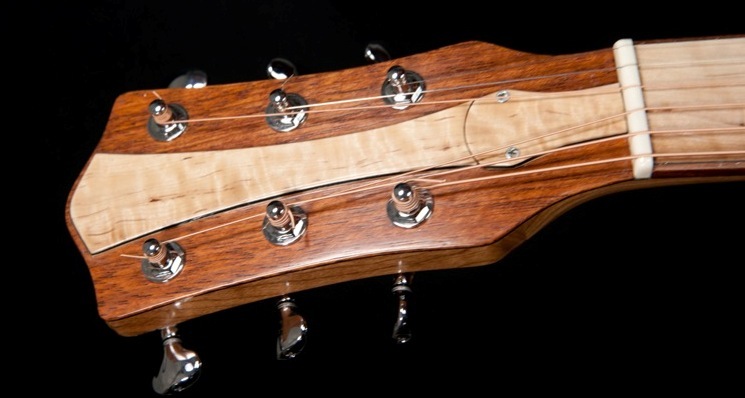 It handles lowered tunings without any loss of definition or volume. 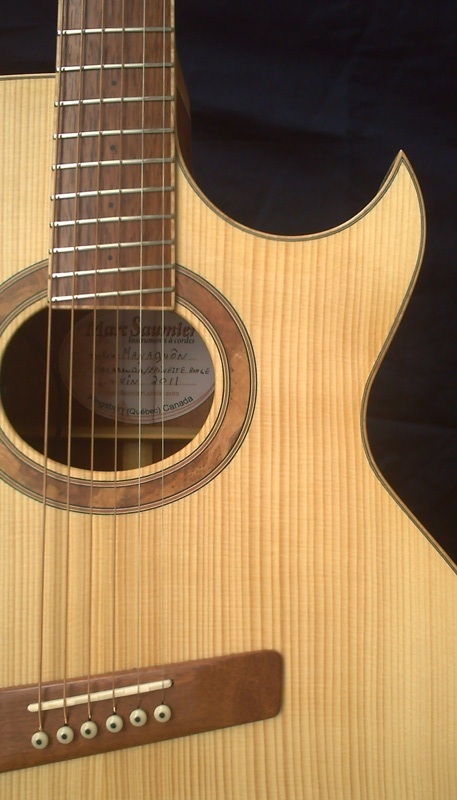 I lowered the sixth string down to A (.056" gauge ) and the results were truly amazing. J'ai joué sur beaucoup de guitares chères et de bonne renommée... et quand j'ai travaillé avec Marc en 2008 j'ai eu la chance d'essayer toutes ses créations. Les manches sont tout simplement parfaits! Et chaque guitare a son propre son et sa propre personnalité. 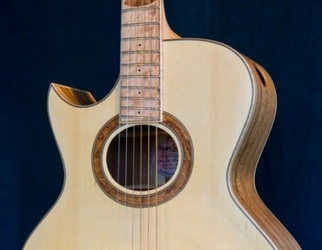 guitares acoustiques Saumier 14 1/8 pouces, faite en 1998.